The third weekend of February seems fairly uneventful, but birders and nature lovers know how to make these days count… by counting. Did you participate in the Great Backyard Bird Count? I counted birds not at my own feeders but at those of my mother-in-law, where my best sighting was a single Northern Raven that croaked back and forth for hours in the unexpectedly warm winter sun. Corey had an embarrassment of riches to choose from this weekend. His Best Bird of the Weekend wasn’t a Pink-footed Goose, a Barnacle Goose, an Eared Grebe, or a Northern Saw-whet Owl, even though he saw all of those species. Neither was it an American Bittern, a Harlequin Duck, nor any of the three scoters despite him seeing all of those as well. 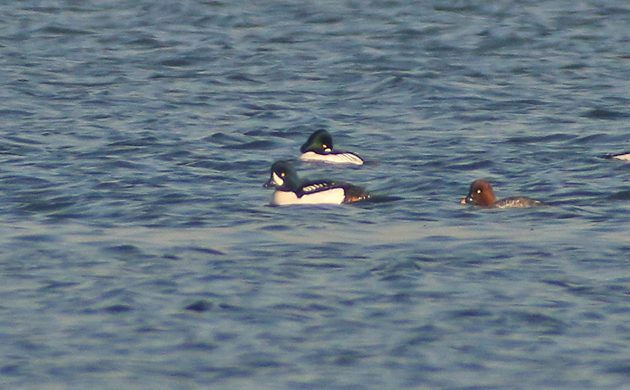 Instead, Corey chose his first Barrow’s Goldeneye in a couple of years as his Best Bird of the Weekend. It’s a good duck and he’d missed seeing them. Easy: I finally gave up on having the mountain come to Mohammed, and drove to see the Robert Moses SP great gray owl, which I had all to myself for about half an hour before the m.ob. descended. What a bird!! I certainly can’t compete with Corey’s incredible observations, but a fine male Smew near Heidelberg was true eye candy. Nice! Alison has sabbatical next spring, so we are likely to be around HD on and off. I like the sound of Cory’s weekend but did alright myself with lots of year birds, best being two Lanceolated Monklets at La Marta reserve. Pretty mundane group pf birds here on the Baja this weekend. We spent most of Sunday, my wifes Birthday, exploring some remote desert roads. The roads were in pretty sloppy shape given the huge rainfall from the day before but there were a few nice birds out and about. Always fun to see the endemic Gray Thrashers, and the surpriseing amounts of Black-headed Grosbeaks this year. But..the biggest surprise was not a bird, but while taking a short roadside lunch break, we had a very large Bobcat walk down the road towards us.